No two boards are ever alike. 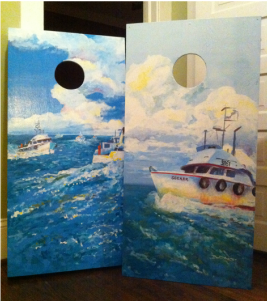 We specialize in nautical designs, but can paint whatever you think of. Don't know what you want? Based on your ideas, we will design samples for your review and you get to pick! The legs are hinged so they fold up nicely under to store flat. Oh yeah, corn-filled or weather proof bags are included. You pick the colors!